Jolly entered on a five-year short commission as a Surgeon Lieutenant, then, in 1972, completed the arduous commando course — reputed to be the toughest in the world — earning himself the coveted green beret. Despite this he refused to carry a gun during the Falklands conflict, explaining that he was there to save lives not take them. 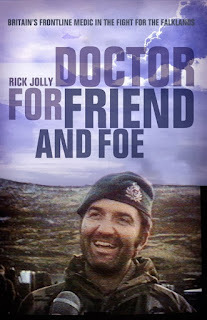 In his book Doctor for Friend and Foe, Jolly describes how his Falklands campaign began just before 5 in the morning in April 2nd. He was called by Lieutenant Colonel Ivar Hellberg the Commanding Officer(CO)of the Commando Logistic Regiment,Royal Marines. He would remember as well the cheerful can do attitude by Caoptain Chs Kirton,the Mobilization Stores Officer at Ludgershall. 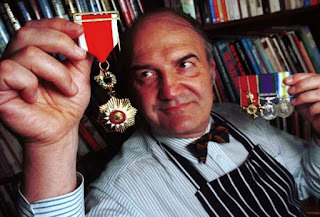 Dr Jolly was never carried out by the stereotype imposed on Argentines and described then by a history graduate. Instead he did some reasearch in which he found that there was no predisposing ill will towars Great Britain amongst masses in Argentina and, what´s more ,in Buenos Aires he found there were even public buildings that bore the stamp of British arquitechture and design. He rembered as well the advise of Marine Garcia who was raised in South America telling: ¨these guys will not negotiate from what they perceive is a position of strength¨. It was of an utmost importance for him to train his men in gunshot wounds through colourslides. A process which was called The Doc Jolly´s Horror Show. Dr Jolly described his first war casualty as an idle idiot of a fire sentry in Europic Ferry who had been playing with a grenade detonator. Out of boredom he removed the firing pin, then tried to replace it. To his amazement he found that the concept of delayed primary suture was not know among the medical and nursing staff of the Uganda but the same mistake was observed among Argentine patients treated by their own doctors. The HMS Ardent suffered three attack waves. The third on May 21 at 15.01hs by six A-4Q Skyhawks of the EA33. La HMS Ardent burned all night and finally sunk at 04.30 on May 21. Ajax Bay is a settlement on East Falkland. It is on the north west coast, on the shore of San Carlos Water, a few miles from Port San Carlos. It was mainly a refrigeration plant, and was developed by the Colonial Development Corporation in the 1950s, which was also responsible for developing Port Albemarle. Many of the pre-fabricated houses were moved to Stanley. During the conflict, the first British bridgehead was established on San Carlos Water. Ajax Bay was one of three landing points, and codenamed "Red Beach" as part of Operation Sutton. As the nearby ammunition dump was a legitimate target, the British land commander, then Brigadier Julian Thompson, ordered that no red cross be painted on the hospital’s tin roof, in line with the Geneva Convention. Casualties from the battles at Goose Green, Mount Harriet and Mount Longdon, as well as 120 men from the crippled RFA Sir Galahad, were all dealt with successfully in these basic conditions. His first Argentine casualty was a young pilot of a Skyhawk A4C, Lieutenant Ricardo ¨Tom¨ Lucero (C-319), shot down by a missile Rapier . Lucero was badly injured when he ejected into the water. The Royal Marines raced to get him, dragged him into a boat and took him back to HMS Intrepid (the same ship he attacked) and then to Ajax Bay. Jolly said : It made me feel sick to think that Royal had been pointing a rifle at the chap instead of helping him. Lucero´s left kneecap was about four inches away from its customary position. Instead Jolly ensured that a message reached Lucero’s wife, Marta, informing her that he was alive and had been taken prisoner. Lucero credited the British with saving his life. Dr Jolly said: It suddenly struck me, with total clarity that I was watching history in the making, as well as the phenomenon of history repeating itself. I picked myself up off the floor sat on the canvas seating, and brerathed a huge sigh of pride and relief, realising that I had now done at least one genuinely useful thing in my life. As a team and against the odds we had saved another human being from death! 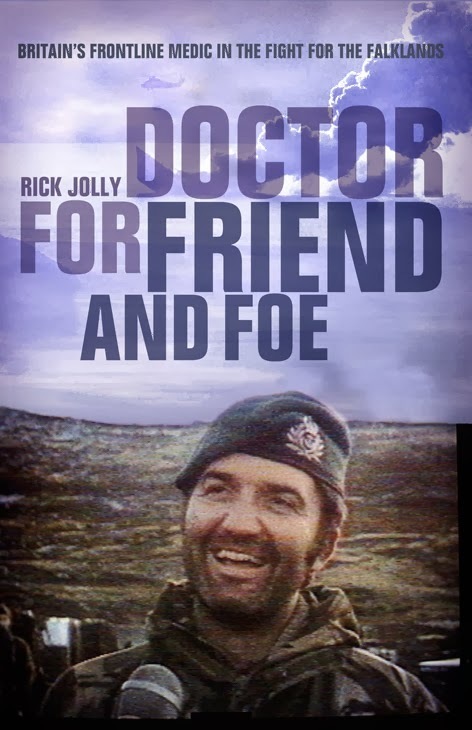 Jolly’s books included The Red and Green Life Machine: A Diary of the Falklands Field Hospital (1984) which sold 40,000 copies, Jackspeak: a Guide to British Naval Slang and Usage(2011), which is still in print and explains such terms as “scab-lifter” (doctor), “a drop of roughers” (heavy seas) and “bum nuts” (eggs). (Humane and)and Doctor for friend and foe (2012). 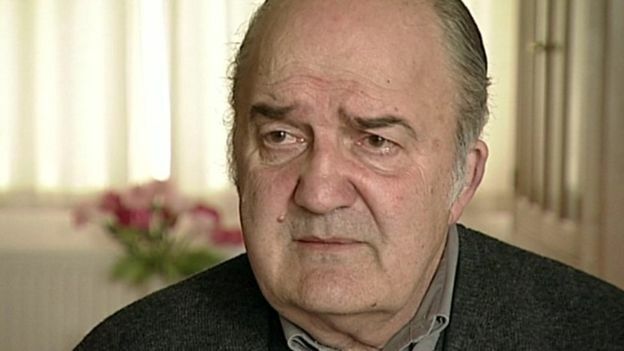 Boyle, Darren-Falklands war hero surgeon who was honoured by both British and Argentine authorities has died aged 71-DailyMail-14 January 2018. Dodd, Vikram- Falklands hero surgeon Rick Jolly dies aged 71-The Guardian- Sun 14 Jan 2018 . Humane and courageous naval officer decorated by Britain and Argentina after the Falklands conflict for saving the wounded of both nations-The Times-January 15 2018. Un médico en pos de la reconciliación-La Nación, 9 de marzo de 1999.